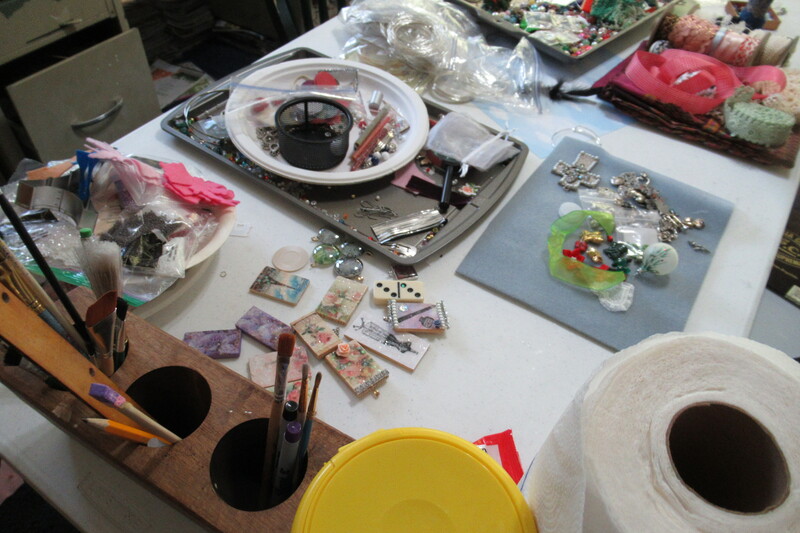 I have finally accepted the fact that I will always have to create a mess to be creative. I can work for days, get this studio sparkly and clean, everything put away, but then the ideas come and the mess comes back . People tell me all the time, just work on one thing at a time, put away one project before you get out another. I know this is supposed to be the way you do it, but that is just not how I can create. I get bored. No matter how much I love to do any one thing, I do one , or maybe ten, and I need to do something else for a while and then I want to go back to the other thing. Sometimes I do not want to go back for a while. But I have always ended up with two to five projects out at a time , well, now that I have the room to do so. 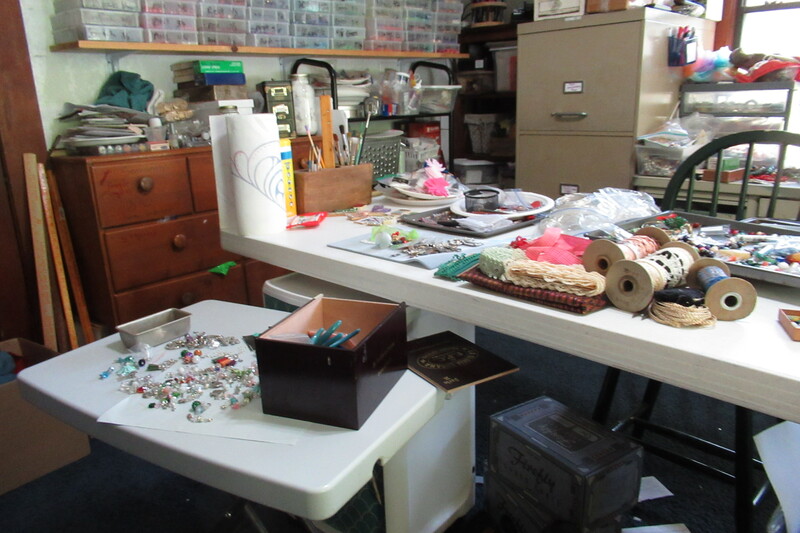 When I did not have a room for working in, I did not have many craft supplies. As I gained this room my supplies grew. I finally had to forbid myself to buy anything . Yeah, that will work. I have a desk covered in jewelry to take apart, not this desk I am working on, but my other desk that my old computer is on, the one the grandkids are allowed to play on. 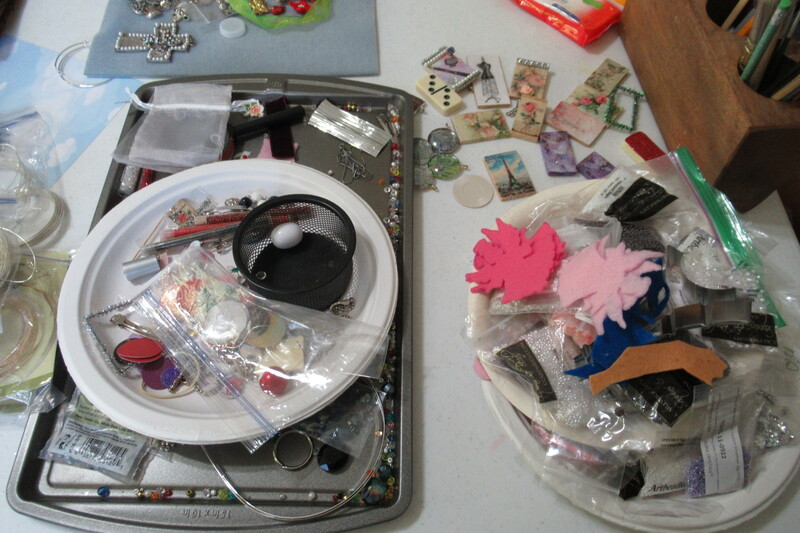 Here is my creative mess, after I did put away a few things and threw away trash and did a bit of housecleaning, lol !! It was too much for even me, but only too about ten minutes so it was not that bad. I would have had that done but took a two day break from the studio to catch up on laundry and some other housework and do a bunch of cooking . Today I did a quick put away and clean up, but left what I will be working on in the next weeks. I actually set up another small work table, that is how bad I am with space !!! The main table behind it has a bunch of projects in different stages of completion. 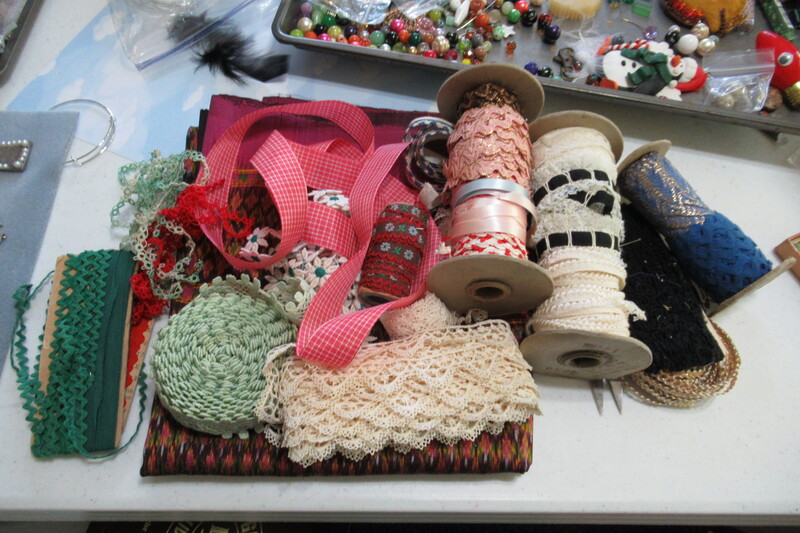 this first picture is some vintage ribbons and lace I am currently working on listing in my Etsy shop. Already had one sale of a pretty roll of lace. 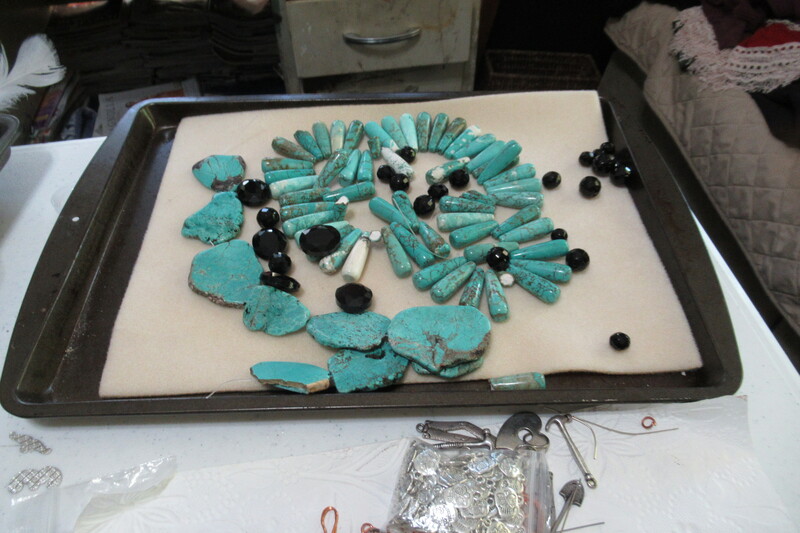 the next is a tray with some beautiful beads, a friend sent me the dyed stones and I got out some black stones I want to try using with some of them. Still in the planning phase, but cannot wait to play with them. I have never had such wonderful big stones to work with before !!! I am very excited !! 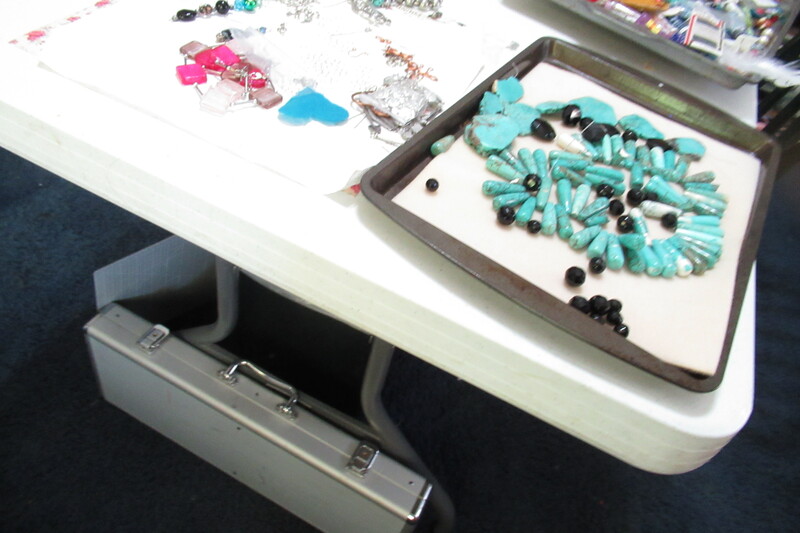 The two trays are beads,well, and some other crafty things, I will probably combine onto one tray, I used these loose beads to make a lot of different beaded charms. Next to that is my pile of wire, some of it sterling. I want to make some handmade findings. The next is some pendants I need to finish. They are altered art type. I will be sure and post them when I finish them. 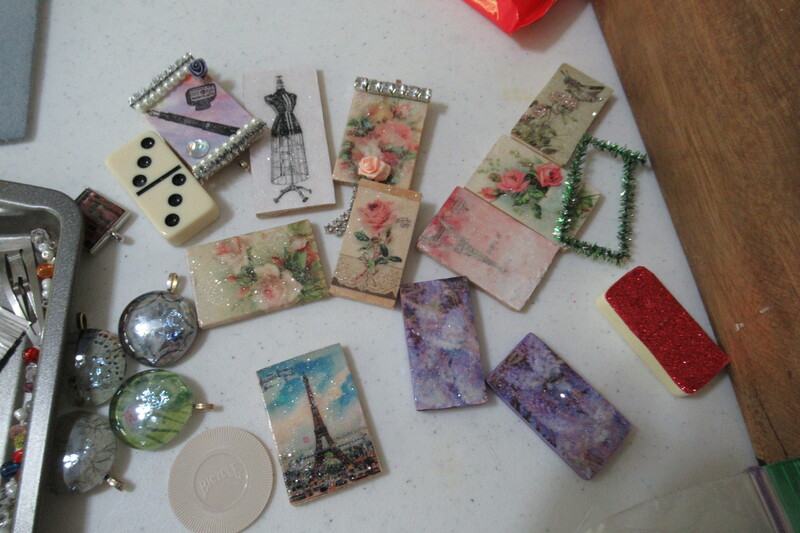 Some flat marble pendants are also in the picture, those are finished. I did those marble ones months ago. Just a bit of my wire stash. I have a lot more than that. Misc mess. 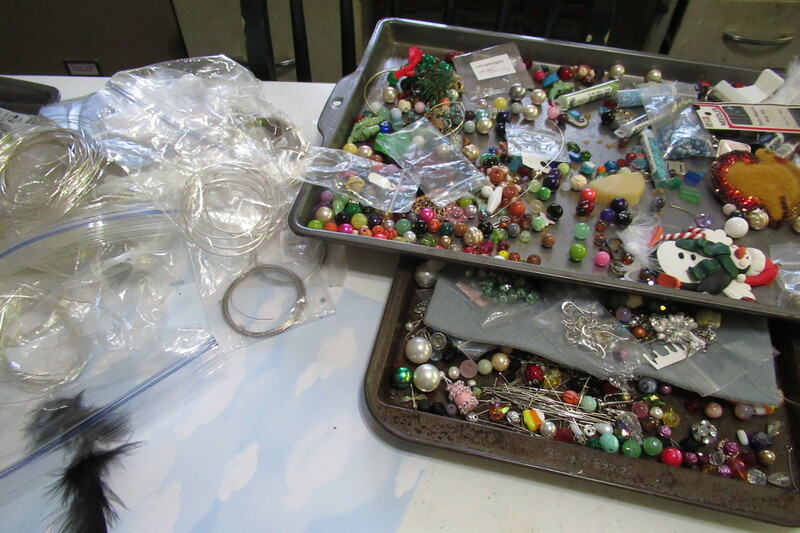 A tray of stuff I need to go through, a papter plate with more stuff, and then a pile of felt cut outs, seed beads and sequins for a lot of projects. 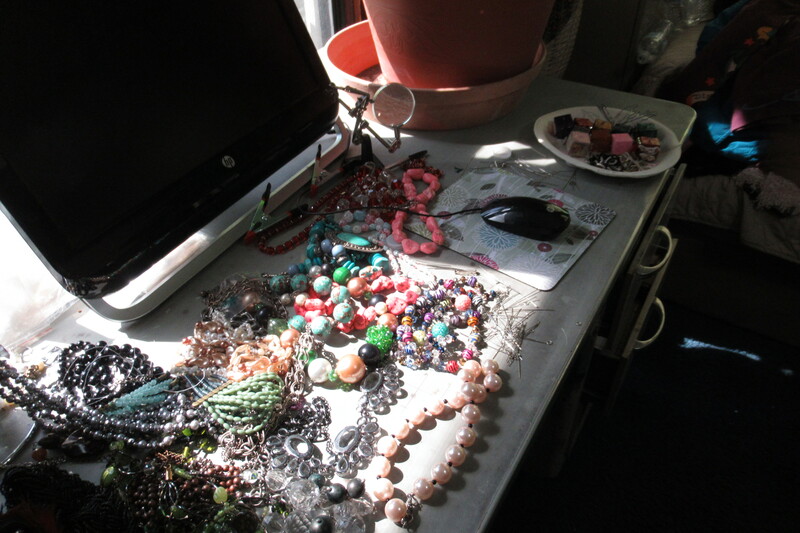 Than my old desk, tons of jewelry I purchased pretty inexpensively at yard sales to take apart for charms and beads. This is not all of it, but a good amount of it. Hard to see with the light coming in, I could not get it down even by closing the mini blinds. 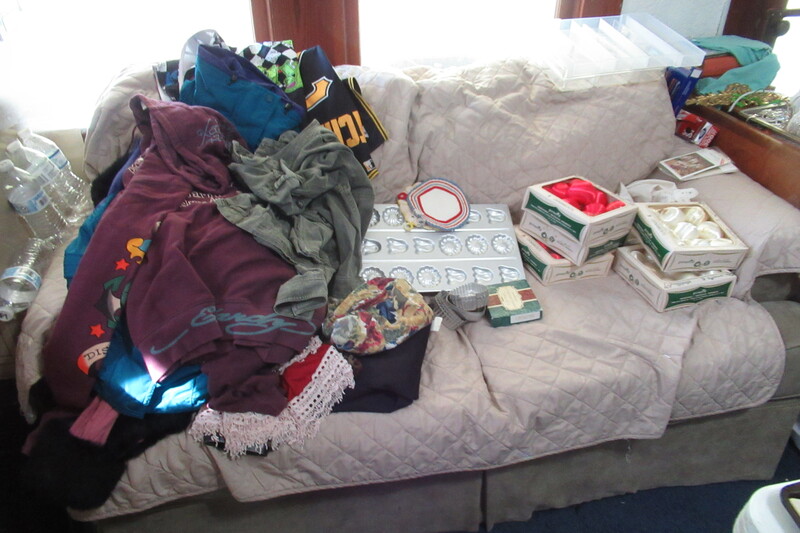 My sofa is stuff for our ebay shop I am going to open back up. Some great clothes, some house hold, and also some satin balls for my huge collection. I will be making ornament kits to list in my Etsy shop. I have sold a few already, and come July will start listing ornament kits for the holidays. Christmas in July. 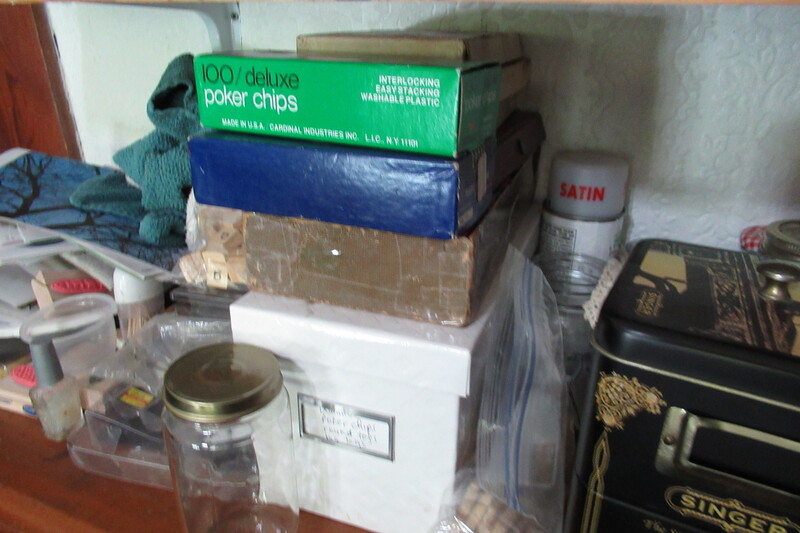 I have so many materials for the fun pendants I mentioned and showed earlier, vintage , dominos in white , black , green and red, scrabble tiles, vintage counting cubes, poker chips, all piled on my dresser, except for my big thing of thicker pocker chips, it is a big case on the floor. I will probably get back to all those pretty soon, just want to get the shops loaded up on Etsy and Ebay first. I will also make up kits from those things too for people who want to create but do not want to buy a bunch of materials, I can put together small amounts for a pendant or two at a time. Just scored a big heavy metal case of poker chips, the thick kind, with nice red dice and a some cards in it. Looking forward to playing with all those things soon. So, I have learned, I will never , ever, just get out one project at a time. That is not how I can create. I need to see several things going at once. 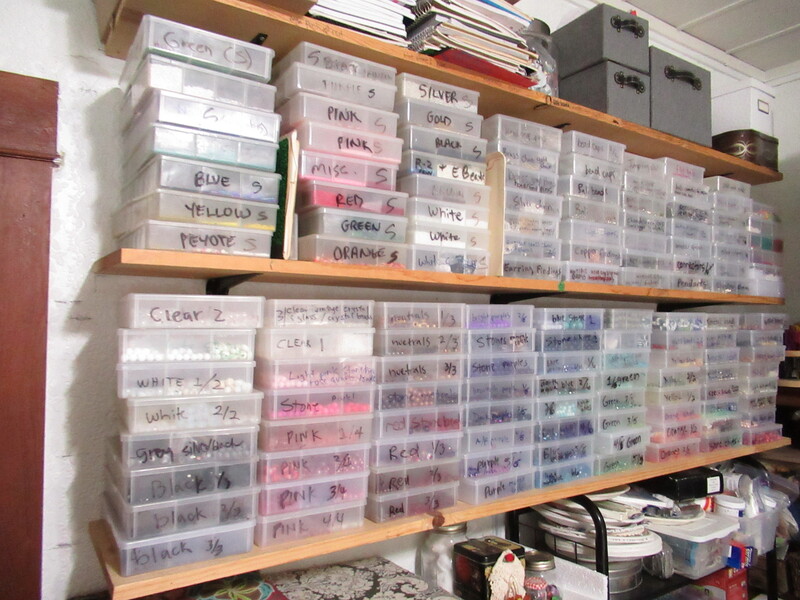 I know it would drive a lot of people crazy, but look at my shelf, most of those trays area also loaded with beads, sequins, seed beads, charms and so on. Most of them a project that I started and never finished, or finished and never got it put up because I was going to do something else. The bottom two racks are a project for a friend/ customer. The rest is my crazy mess !!! 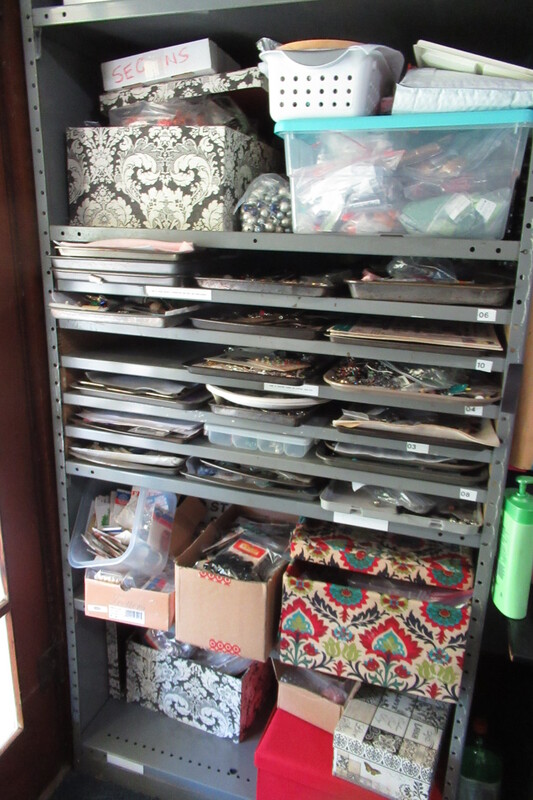 the plastic box in front on top is all seed beads, the patterned box next to it is all sequins, the bag on top of the seed beads is sequins, the white platic box is all made sequin projects, and the bottom shelf is all sequins in those boxes. Along with the left side of the second from the bottom. 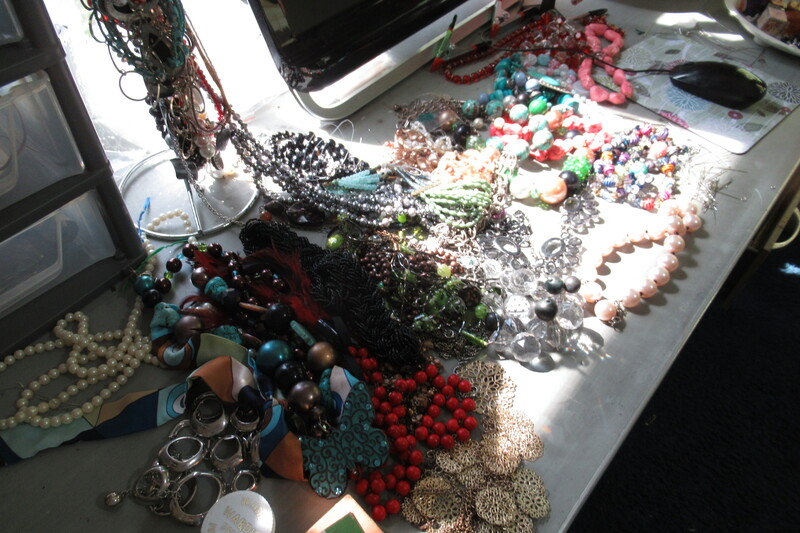 The colorful box is all my little baggies for jewelry and beads and stuff. 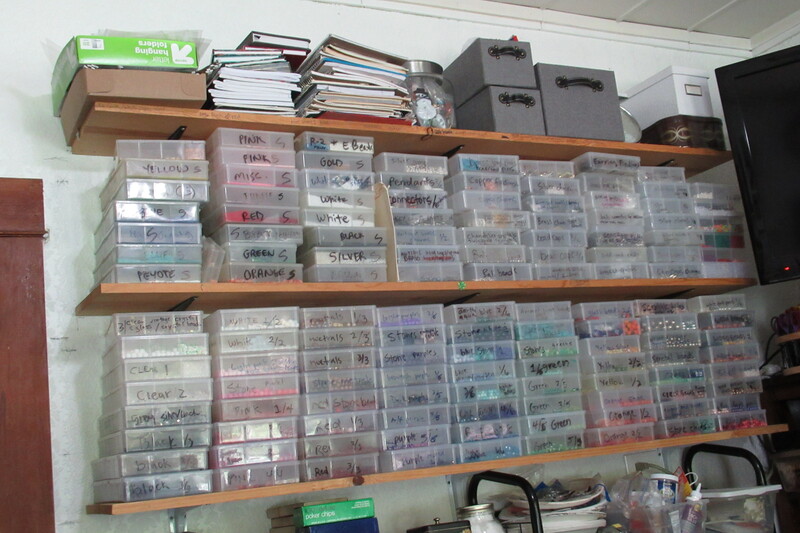 There are two shelves above the seed beads and sequins, they are other crafts and projects and some display stuff and mailing stuff. 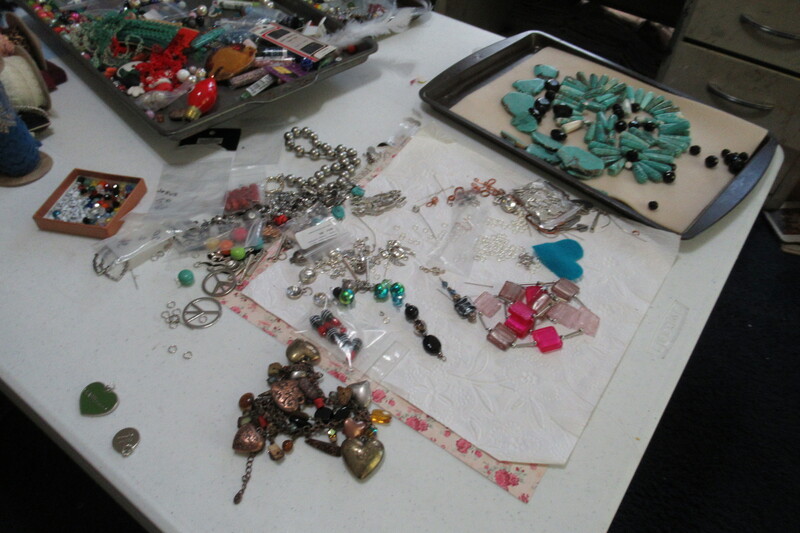 So, if , like me, you have to have a mess to be creative, it is okay !! Not all of us are able to be organized and neat. That said, I could get this room together and neat in a half hour if needed. NOT counting the trays on the big shelf mind you. We use this room for grandkids sometimes and I can get it clean pretty quickly when I need to. And cleaned right , not just thrown somewhere. 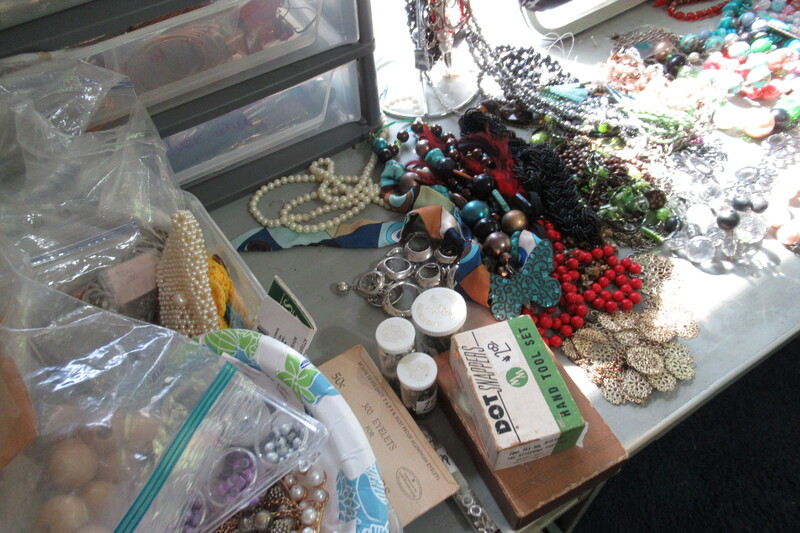 I do have the trays, but most of that stuff will come out as I list stuff on Etsy, and as I make stuff. Some will get put into the boxes on my shelf, a bit over time. I am so grateful for my wonderful hubby who made this wonderful tray storage for me. I have wanted something like that for almost 30 years but did not have a space to do it. Of course back than my collection was much, much smaller too , but I still have a large amount of seed beads and sequins from way back then !!! This shelf is where I keep most of my beads, charms, and findings. The top shelf is more office supply stuff because I have to climb on a step stool to reach it. 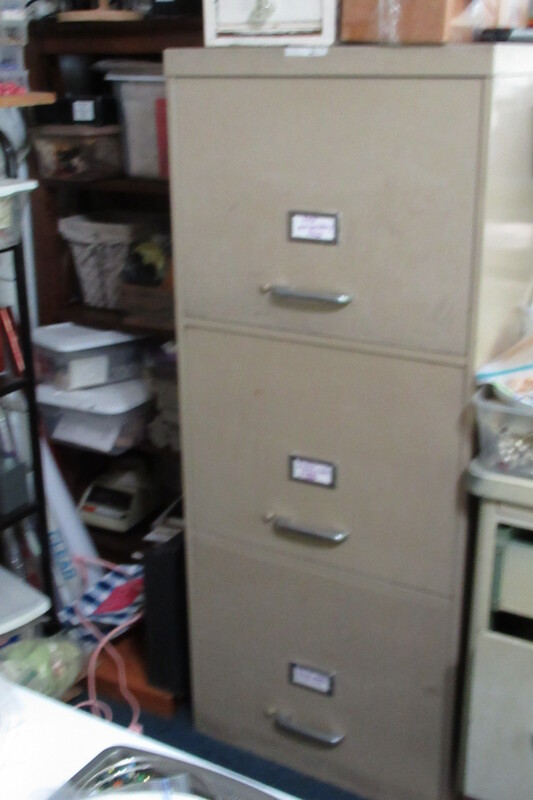 I have two absolutely HUGE filing cabinets, this one is felt in the top drawer, sheets of felt, cuts outs I have done and felt scraps plus my embroidery floss and hoops. Second and third drawer and misc craft supplies. Cardboard, plastic , and so one. I might at some point combine them into one drawer. These are very deep drawers, so lots of great storage. The other one is mostly vintage, with some new pipe cleaners. Yes, I have a ton of pipe cleaners. I absolutely love the things. Not sure why, but I got a great deal on a ton of vintage ones and grabbed them, but already had some. So, the top drawer is full of them, except for a few strings of garland I picked up at 90 percent off after Christmas to make some of those cone / garland Christmas trees. The middle drawer is full of all my cookie cutters, I have life long collection, some dating back to childhood, and even a couple my grandpa made my grandma so many years ago, and mind you, I have given my married kids a bunch of cookie cutters each. But I add all the time. I use them not just for baking, but for crafts and until my wonderful husband brought my this amazing file cabinet home from work when they were tossing it last summer, I had no place to store them. 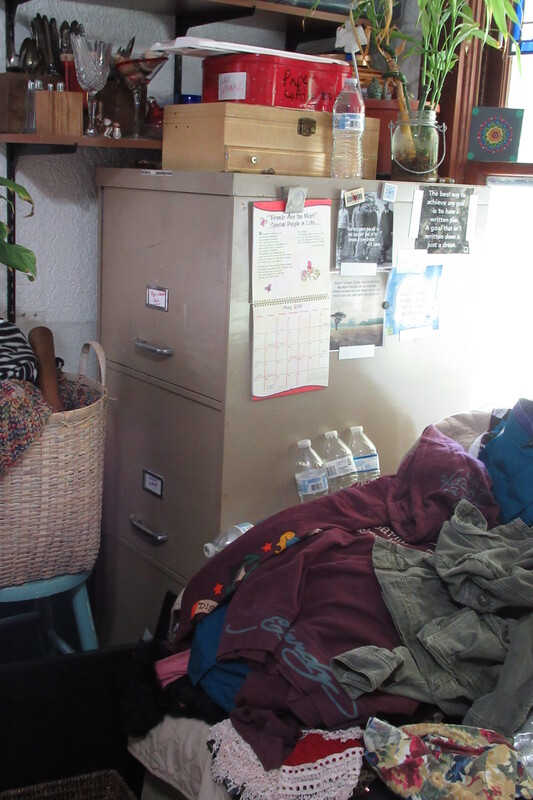 The bottom drawer is our grands kids art supplies , but that is coming out so I can store the ebay clothes and other items for sale in our shop. The water bottles are for my plants, I try to keep water in there to water them, need to fill them again !!! 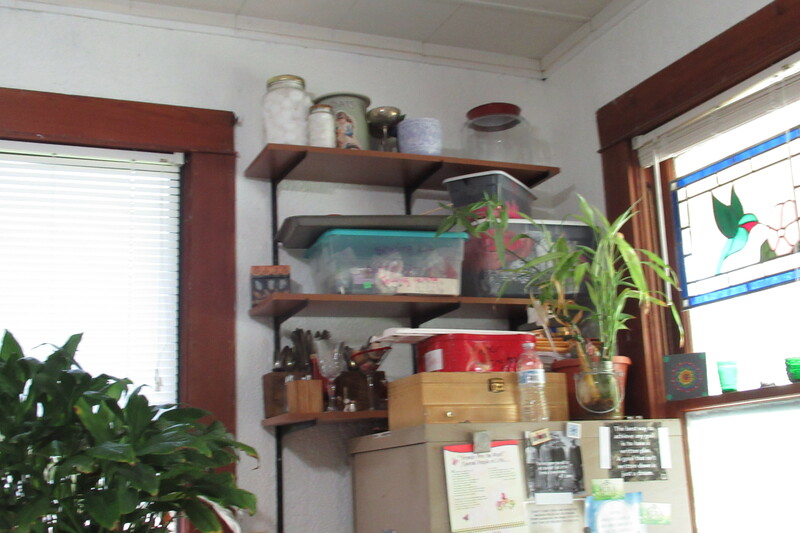 I have shelves above that file cabinet and next to the other one. So, storage is not my issue. 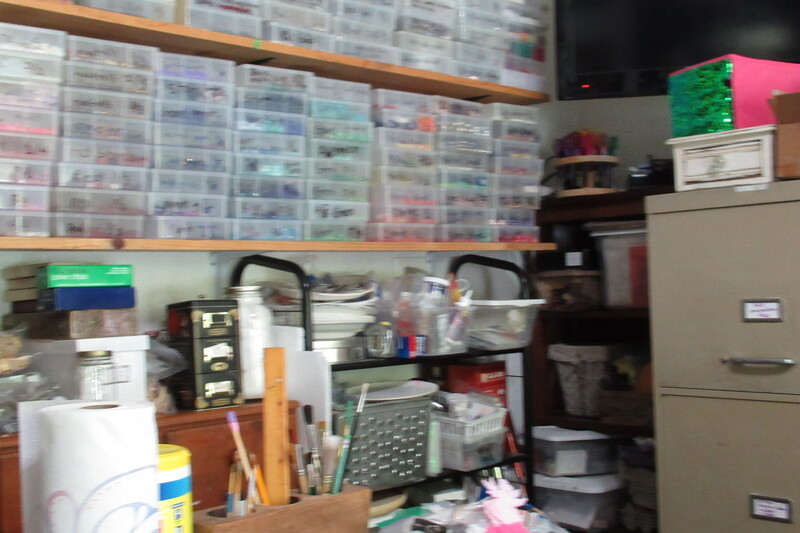 I really think as a creative person, like a gold fish grows to fit its bowl, a crafters art supplies will grow to fit the space they have, lol. I still have space, but I have got to start being more careful when purchasing stuff. 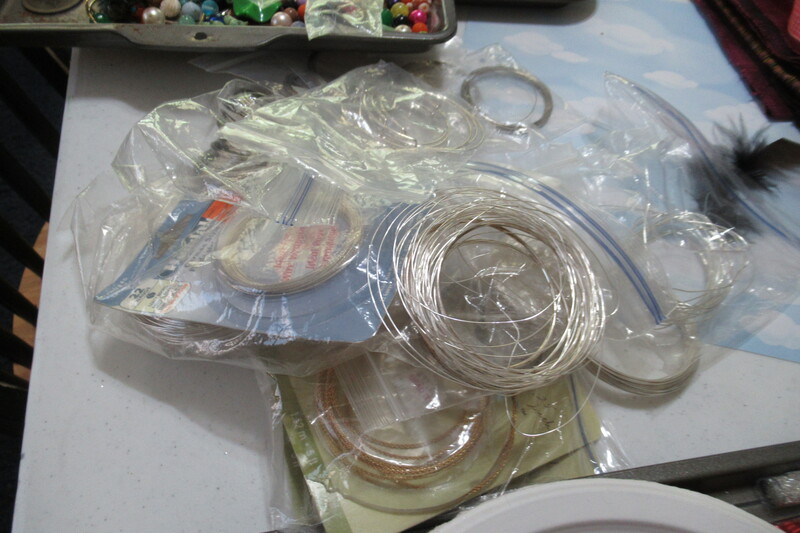 I have so much stuff now, and I tell myself, you can make so many things, you do not need any more supplies. I am not going to go to Hobby Lobby, and then someone says, hey, I am going Hobby Lobby, want to go with me….. and I go…. and there are clearance items, or things on 50 percent off…… and so it goes. Mind you , my husband has no issues with this and often helps me pick out cool stuff to work with. He has his own studio too. Stained glass. So, just create, store what you can, leave out what you will. Be happy you are creative, it is a blessing to create things, and not worth stressing over the mess . 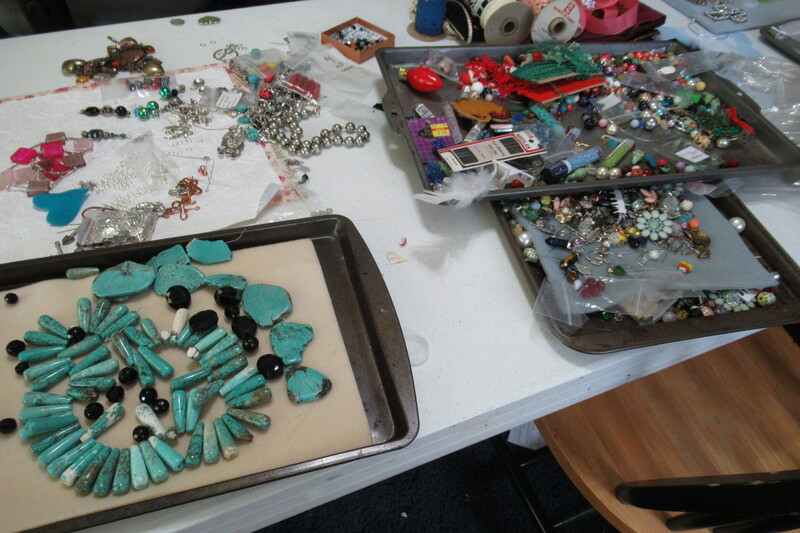 Just enjoy making art, jewelry, whatever you enjoy, make the mess so you can create in it !!! Thanks for stopping by, I would love to hear your views on this subject and how you create, neatly, or in a creative mess like me !!! I’m so glad to see you’re excited about the dyed turquoise.